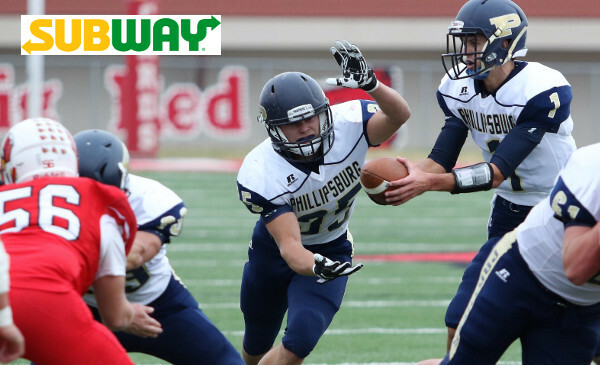 On this special Saturday playoff edition of the Subway Fresh Take, we’ll recap second round playoff action from Class 3A. Silver Lake 25, Nemaha Central 7 – Silver Lake dominated No. 1 Nemaha Central and advanced to the 3A quarterfinals for the first time since 2014. Trent Byers converted a shovel pass into a short touchdown run and caught a 17-yard strike from Mason Griffin as the Eagles built a 13-0 halftime lead. Mitchell Henry’s third-quarter touchdown run pulled the Thunder within 13-7. Nemaha Central had a chance to take the lead with a drive inside the Eagle 20-yard line, but Henry was intercepted by Tristen Stoner. Silver Lake forced three turnovers in avenging last season’s 21-14 loss to Nemaha Central in this same second-round game. Galena 28, Wellsville 6 – Galena won in convincing fashion at Wellsville with a dominating defensive effort. The Bulldogs held the Eagles to 140 total yards, less than 30 yards rushing, and forced three turnovers. Galena led 14-0 at halftime before Wellsville’s lone score cut the lead to 14-6. The Bulldogs answered with a Joseph Helton touchdown run to go up 20-6. Quarterback JC Shelton rushed for a pair of scores and threw a touchdown pass in the game. Galena rushed for more than 300 yards and had two TDs erased due to penalty. Sabetha 28, Perry-Lecompton 6 – Joe Gruber rushed for two touchdowns as Sabetha grinded out a 28-6 victory over Perry-Lecompton. The Blue Jays controlled the game for a second victory over the Kaws season, having won 28-21 back in Week 5. Gabe Garber’s short touchdown run started the scoring and Brandon Brownlee put Sabetha up 15-0 in the first quarter. The Kaws lone touchdown came on a pass from Dalton Kellum to Colton Mallonee. Osage City 37, Caney Valley 21 – Osage City jumped out to a 28-7 lead and cruised to a victory over Caney Valley. Indian quarterback Tucker Kimball accounted for four touchdowns in the win. Osage City flipped the script on the Bullpups which won this second-round match-up 43-16 last season. Osage City advances to the state quarterfinals for the second time in school history. Cheney 56, Marion 0 – Cheney built a 49-0 lead at halftime as Marion turned the ball over seven times in the first 24 minutes. Marysville 36, Larned 28 – Marysville built a 23-point led in the second half and held off Larned, 36-28. Jack Blumer threw touchdown passes to Gabe Pieschl and Jacob Backus to give the Bulldogs a 16-7 lead. Blumer then scored on a short touchdown run late in the second quarter to put Marysville up 24-7 at halftime. Atreyau Hornbeak’s 25-yard touchdown run extended the lead to 30-7 in the third quarter before Larned would answer with an Anthony McConnell touchdown run to trim the lead to 30-14. Marysville would push the lead to 36-14 on a Derek Roever touchdown run. Larned scored twice, pulling to within 36-28 with 3:43 remaining on a Blake Skelton touchdown catch, but Marysville used up the clock and left the Indians with seconds to drive the length of the field. Hesston 45, Conway Springs 42 – Jorge Morales connected on a 24-yard field goal as time expires to lift Hesston to a 45-42 victory at Conway Springs. The Swathers and Cardinals battled in a back-and-forth game that saw four ties and the lead change hands four times. Hesston used a balanced offensive attack that put up 518 yards of total offense including 271 passing and 247 on the ground. Cameron Cox’s 29-yard touchdown pass on the final play of the second quarter gave the Swathers a 28-22 lead at the break. Conway Springs tied the game early in the third quarter on a Trenton Jones 32-yard run. Cox and Jones would then exchange touchdowns again leaving the score knotted at 34 after three quarters. Hesston took its largest lead, 42-34, on a Cox touchdown pass to Grady Toews and two-point conversion run by Parker Roth. Conway Springs would answer with a 4-yard run by Jones with 3:38 remaining. Colton Terhune’s two-point pass to Chase Blaine tied the score again, 42-42. Hesston drove the length of the field setting up Morales’ game-winning kick. Cox passed for 271 yards and three scores and rushed for 154 yards and three more touchdowns. Conway Springs was led by Jones 166 yards and four touchdowns, while Terhune added 118 yards and a score. Phillipsburg 35, Hoisington 6 – Phillipsburg outscored Hoisington 28-0 in the second half to turn a 7-6 halftime lead in to a 35-6 victory. Freshman Ty Sides returned a punt to the Hoisington 4-yard line setting up a John Gower touchdown run 1-play later to put the Panthers up two scores in the third quarter. Kirk Coomes rushed for 179 yards and two touchdowns to lead the Panthers, while Gower, quarterback Trey Sides, and Treylan Gross also added touchdowns. Sean Urban led Hoisington with 89 yards and a touchdown on the ground.